Buy Quartz Jewelry at I Got Your Silver Lining Fine Jewelry. Complimentary Shipping & Personal Shopping Concierge Services on all purchases. Take advantage of our wholesale promotional pricing for a limited time only. The 2015 colors are bold with yesterday's influence: Designers are intrigued with of color ghost of years past, but are spicing things with spirit of the present of the here & now. You will see a definite influence of the retro era with a touch of exotic imaginary characterized in the these bold colors for this season. The color trend includes purple, muted neon orange & yellow, royal blue, aluminum, aurora red, sangria, mauve mist, cognac, bright cobalt & cypress emerald green. From IGYSL's "Up and Comer's Collection", here's your chance to own a beautiful, all natural & color trendy 'Emerald Colored Green Quartz (Oval, 3.50ct, Cabochon Cut) & White Topaz (1.25ctw, Round Cut) Ring' set in Platinum over Sterling Silver. Enjoy the benefits of owning platinum overlay. Platinum is hypoallergenic, which makes it the best choice for anyone with sensitive skin. Platinum is the rarest of all the precious metals, even more so than Gold, making it a rare treasure indeed. And, by overlaying Sterling Silver with Platinum, you will not have to worry about your ring tarnishing near as quickly, or at all. *Treatment Disclosure: Heating (H). As with most natural gemstones, assume they have undergone heat treatment. Heating is an acceptable treatment in the gemology trade. WONDERFUL RING AT REASONABLE PRICES HERE AT THIS JEWELRY STORE. REPEAT CUSTOMER HERE! THANKS! Love this jewelry store. Great products and the best customer service that I've ever experienced. They are a class act and know what picky customers expect. 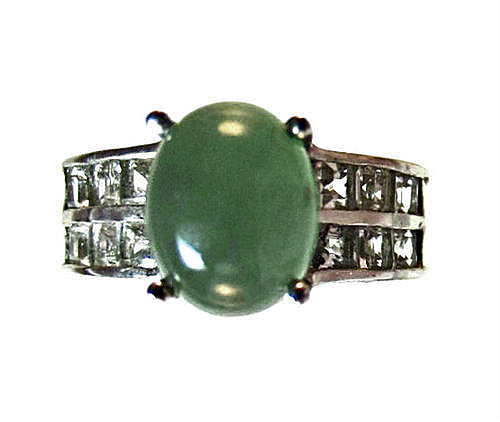 Click the button below to add the "Emerald Green" Quartz & White Topaz Platinum Over Sterling Ring to your wish list.